For the Amalgam Comics character, see Magneto (Amalgam Comics). For the character from Strange Tales, see Magneto (Atlas Comics). Magneto (/mæɡˈniːtoʊ/) is a fictional character appearing in American comic books published by Marvel Comics, commonly in association with the X-Men. 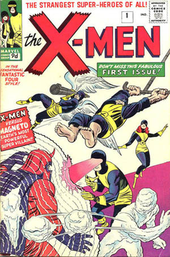 Created by writer Stan Lee and artist Jack Kirby, the character first appears in The X-Men #1 (cover-dated Sept. 1963) as an adversary of the X-Men. The character is a powerful mutant, one of a fictional subspecies of humanity born with superhuman abilities, who has the ability to generate and control magnetic fields. Magneto regards mutants as evolutionarily superior to humans and rejects the possibility of peaceful human-mutant coexistence; he initially aimed to conquer the world to enable mutants, whom he refers to as homo superior, to replace humans as the dominant species. Writers have since fleshed out his origins and motivations, revealing him to be a Holocaust survivor whose extreme methods and cynical philosophy derive from his determination to protect mutants from suffering a similar fate at the hands of a world that fears and persecutes mutants. He is a friend of Professor X, the leader of the X-Men, but their different philosophies cause a rift in their friendship at times. Magneto's role in comics has varied from supervillain to antihero to superhero, having served as an occasional ally and even a member of the X-Men at times. His character's early history has been compared with the civil rights leader Malcolm X and Jewish Defense League founder Meir Kahane. Magneto opposes the pacifist attitude of Professor X and pushes for a more aggressive approach to achieving civil rights. Magneto was ranked by IGN as the Greatest Comic Book Villain of All Time. Sir Ian McKellen portrayed Magneto in five films of the X-Men film series, while Michael Fassbender portrayed a younger version of the character in three films. X-Men #1 (Sept. 1963) is Magneto's first appearance. Written by Stan Lee and art by Jack Kirby. Magneto first appeared in the debut issue of X-Men in 1963. Through the 1960s, Magneto appeared in several issues of the original X-Men comics, including Uncanny X-Men, X-Men, Astonishing X-Men, Alpha Flight, Cable, Excalibur, The New Mutants, many X-Men miniseries, and several other Marvel titles. His first solo title was a one-shot special, Magneto: The Twisting of a Soul #0 (September 1993), published when the character returned from a brief absence; it reprinted Magneto-based stories from Classic X-Men #12 & 19 (August 1987 & March 1988), by writer Chris Claremont and artist John Bolton. In a 2008 interview, Stan Lee said he "did not think of Magneto as a bad guy. He just wanted to strike back at the people who were so bigoted and racist... he was trying to defend the mutants, and because society was not treating them fairly he was going to teach society a lesson. He was a danger of course... but I never thought of him as a villain." In the same interview, he also revealed that he originally planned for Magneto to be the brother of his nemesis Professor X. Writer Chris Claremont confirmed that Malcolm X was an inspiration for Magneto's development, as Martin Luther King Jr was for Professor X.
Magneto's first original title was the four-issue miniseries Magneto (November 1996 - February 1997), by writers Peter Milligan and Jorge Gonzalez, and penciller Kelley Jones. In the miniseries, Magneto had been de-aged and suffered from amnesia, calling himself Joseph; it was later revealed that Joseph was a younger clone of Magneto. Later, Magneto became ruler of the nation Genosha. Later, Magneto appeared in two miniseries; Magneto Rex (written by Joe Pruett and drawn by Brandon Peterson) and Magneto: Dark Seduction (written by Fabian Nicieza and drawn by Roger Cruz). A trade paperback novel detailing Magneto's childhood, X-Men: Magneto Testament was written by Greg Pak and released in September 2008. Pak based Magneto Testament on accounts from Holocaust survivors. Before the publication of X-Men: Magneto Testament, Magneto's personal background and history were established in Uncanny X-Men #150 (Aug. 1981). He was portrayed as a Jewish Holocaust survivor; while searching for his wife Magda, a Sinti, Magneto maintained a cover identity as a Sinti. This created confusion among some readers as to Magneto's heritage, until his Jewish background was confirmed in Magneto: Testament. (Left) Max and Magda escape from the Auschwitz-Birkenau death camp; (Right) Max and Magda with their daughter Anya. Art from X-Factor Annual #4 (1989) by John Byrne. Magneto was born Max Eisenhardt sometime in the late 1920s to a middle-class German-Jewish family. Max's father, Jakob Eisenhardt, was a decorated World War I veteran. Surviving discrimination and hardship during the Nazi rise to power, the passing of the Nuremberg Laws in 1935, and Kristallnacht, Max and his family fled to Poland where they were captured during the German invasion of Poland and sent to the Warsaw Ghetto. Max and his family escaped the ghetto, only to be betrayed and captured again. His mother, father, and sister were executed and buried in a mass grave, but Max survived, possibly due to the manifestation of his mutant powers. Escaping from the mass grave, he was ultimately captured yet again and sent to Auschwitz, where he eventually became a Sonderkommando. While at Auschwitz, Eisenhardt reunited with a Romani girl named Magda, whom he had fallen in love with when he was younger, and with whom he would escape the concentration camp during the October 7th 1944 revolt. Following the war, he and Magda moved to the Ukrainian city of Vinnytsia, and Max adopted the name "Magnus". Magda and Magnus had a daughter named Anya, and lived uneventfully until an angry mob, spurred on by the first manifestation of Magnus' powers, burned down their home with Anya still inside. Magnus was enraged at the mob for preventing him from rescuing Anya, and his powers were unleashed, killing the mob and destroying a part of the city. Magda, terrified at Magnus' power, left him and later gave birth to the mutant twins Pietro and Wanda before she died. Wanted by the authorities for the deaths and destruction in Vinnytsia, and while searching for Magda, Magnus paid a Romanian forger, George Odekirk, to create the cover identity of "Erik Lehnsherr, the Sinte gypsy". "Erik" relocated to Israel, where he met and befriended Charles Xavier while working at a psychiatric hospital near Haifa. There, the two debated the consequences humanity faced with the rise of mutants, though neither revealed to the other that they were mutants. However, they were forced to reveal their inherent abilities to one another while facing Baron Strucker and Hydra. Following the battle, Erik, realizing that his and Xavier's views were incompatible, left with a cache of hidden Nazi gold, which provided him with the finances to pursue his goals. Magneto and Xavier would eventually part ways because of the differences in their beliefs on how to help mutants. Art by Carlos Pacheco. Magneto's experiences surviving Nazi Germany, Auschwitz, and Vinnytsia would shape his outlook on the situation that mutants face in the Marvel Universe. Determined to keep such atrocities from ever being committed against mutantkind, he is willing to use deadly force to protect mutants. He would believe that mutants ("Homo superior") will become the dominant life form on the planet and would set about either creating a homeland on Earth where mutants could live peacefully, or conquering and enslaving humanity in the name of mutantkind. Magneto's first villainous act is attacking a United States military base called Cape Citadel after bringing down missiles. He is driven off by Charles Xavier's mutant students, the X-Men, in their first mission. He creates Asteroid M, an orbital base of operations in a hollowed out asteroid. He then gathers a group of angry and disillusioned mutants including his own, albeit at the time unbeknown to him, son and daughter Quicksilver and the Scarlet Witch and formed the Brotherhood of Evil Mutants to further his goals. Magneto briefly conquers the South American nation of San Marco in the hopes of establishing a mutant homeland there, but is again foiled by the X-Men. He tries to make the Toad infiltrate the X-Men. When that failed, he captures the Angel and tries to force him to tell the secrets of the X-Men. However, the other X-Men rescue their member and destroy Asteroid M.
Magneto then creates the Savage Land Mutates. With the Savage Land Mutates, he clashes with the X-Men and Ka-Zar. Along with Namor, Magneto later attacks New York City. He later fights the Inhumans Royal Family, and battles the Avengers once more. Magneto later reorganizes the Brotherhood, and fights Professor X and the Defenders. Using ancient and advanced alien technology he found near the core of the earth, Magneto creates the artificial humanoid "Alpha the Ultimate Mutant". Alpha rebels against his creator and reduces him to infancy. Magneto is then placed in the care of Xavier's former love interest, Professor Moira MacTaggert at Muir Island. At Muir Island, MacTaggert discovers that the prolonged and extensive use of Magneto's powers has a disruptive effect on his nervous system and psyche, causing him to become increasingly paranoid and irrational the more he uses them. In an attempt to cure him of this flaw she manipulates the infant Magneto's genetic code, so that when he grows older he will be able to safely use his powers while still remaining rational, in order to prevent him from becoming "evil" in adulthood. However, her genetic tampering soon loses its effect when Magneto reactivates his powers, as the very use of his powers causes his genetic sequence to realign and "reset" to its original state. Magneto is eventually restored to adulthood, but to his physical prime rather than his older, chronological age, by the alien Shi'ar agent Erik the Red. Magneto later gathers a new Brotherhood of Evil Mutants, and with them battles Captain America. He then successfully opposes Doctor Doom's conquest of Earth. Magneto goes on trial for his crimes in Uncanny X-Men #200. Art by John Romita Jr.
Magneto's first steps towards a change in character begin during an encounter with the X-Men, when he lashes out in anger and nearly kills Kitty Pryde, stopping short when he sees that the X-Man that he attacked is a Jewish child — precisely the kind of person he claimed he was fighting to make a better world for. Realizing that he has come to regard the lives of those who oppose him to be as worthless as the Nazis considered his people to be, Magneto stands down and leaves the scene; though most of the X-Men are dismayed that he escaped, Xavier expresses hope that the encounter might prove a turning point for his former friend. Magneto later discovers that former Brotherhood members the Scarlet Witch and Quicksilver are actually his children, simultaneously learning about their recent marriages to the Vision and Crystal. He reveals to Quicksilver and the Scarlet Witch that he is their father. He also discovers his granddaughter, Quicksilver's human child Luna Maximoff. Seeing Luna as a bond to the human race he has rejected, Magneto tries to reach out to his children. Angered by his rejection of them and their mother, they push him away and refuse to forgive him. Magneto finds himself allied with Professor Xavier and the X-Men when a group of heroes and villains are abducted by the Beyonder, a nearly omnipotent alien being. This entity took them to a planet he created called the Battleworld to participate in a personal experiment of his to observe the concept of the battle between good and evil which would later be known as the Secret Wars. The characters were sorted according to their desires; Magneto was placed with the heroes as his desires were based on a wish to help mutants rather than the more selfish drives of the other villains. This surprises many of the other heroes, who still believe him to be a villain, although eventually they come to accept him as an ally. Captain America even speaks in his defense on some occasions, and the Wasp develops a certain affection for him, although it is tempered by her knowledge of his past. After the Secret Wars, Magneto is transported back to his base, Asteroid M. The alien Warlock, traveling to Earth, collides into the asteroid, breaking it to pieces. Magneto falls towards Earth and into the Atlantic Ocean, sustaining serious injuries. He is rescued by Lee Forrester, the captain of a fishing trawler. Lee takes him to the same island in the Bermuda Triangle where he'd once held her captive; there she helps him recuperate from his injuries, and the two become lovers. Though Magneto makes a substantial effort as the headmaster of the New Mutants and an ally to the X-Men, his tenure is disastrous. His responsibilities to the school force him to separate from Lee, who he felt would have been a strong guiding hand and emotional support. The Beyonder plagues him yet again, slaying Xavier's current students, the New Mutants, and bringing them back to life soon after. This deeply traumatizes the entire group. Magneto is then manipulated by Emma Frost into battling sanctioned heroes the Avengers and the Supreme Soviets. Magneto submits to a trial once again, but uses mind-control circuitry he salvaged from the wreckage of Asteroid M to alter the opinions of the head justice in charge of the trial. As a result, Magneto is finally absolved of his past crimes but finds that this only fuels hostility towards mutants. Feeling that desperate measures need to be taken after the genocidal massacre in the Morlock tunnels, Magneto and Storm join the Hellfire Club jointly as the White King. He is unable to prevent his students Roberto da Costa and Warlock from running away from the school, or to prevent the death of the young mutant student Douglas Ramsey after the students sneak away yet again to save a friend, and witnesses the apparent death of all of the senior X-Men on national television. His relationship with the New Mutants deteriorates even further when they see him and the Hellfire Club negotiating with the demons of the Inferno incident. Magneto later ousts longtime Hellfire Club co-chair Sebastian Shaw in order to establish himself as the head of the Hellfire Club. To win the support of the other Club members against Shaw, he claims that his reformation was all a pretense in order to use the X-Men and New Mutants as pawns in a long-term scheme to take over the world. In response, the New Mutants, who had already decided to leave Magneto's tutelage, declare themselves his enemies. Seeing conditions for mutants grow progressively more perilous, Magneto begins seeking allies to protect mutants from humanity. He participates in the Acts of Vengeance alongside such established villains as Doctor Doom, the Wizard, the Mandarin, and the Red Skull. [volume & issue needed] His temporary alliance with the Red Skull — an unrepentant Nazi war criminal — is a highly uneasy one. After confirming that the Skull was the original one who had worked with Hitler, Magneto takes revenge upon him by entombing him alive. When Zaladane is able to appropriate the magnetic powers of Polaris, Magneto works alongside Rogue, Ka-Zar, and the American intelligence agent Nick Fury as well as a number of Russian operatives in order to reestablish peace in the Savage Land. This leads to an altercation with Zaladane, who appropriated the magnetic powers of Magneto in addition to those of Polaris. The conflict ends with Magneto reclaiming his powers and executing Zaladane himself. With her death, Magneto renounces his previous efforts to act as a mentor to the New Mutants and to follow Xavier's beliefs in peaceful co-existence between mutants and normal humans. Tired of the constant strife, Magneto rebuilds his orbital base and retires to a life of quiet seclusion. At this point, he is a figurehead for the cause of mutantkind and is sought out by a group of mutants calling themselves the Acolytes, who pledge their service and allegiance to him. Under the influence of one of them, Fabian Cortez, he declares Asteroid M a homeland for mutantkind, obtaining nuclear missiles from a Soviet submarine he had previously destroyed and placing them around the Asteroid pointed towards Earth. The United Nations Security Council, in response to a resurgent Magneto, votes to activate the "Magneto Protocols" — a satellite network, in slightly lower orbit than Avalon, which skews the Earth's magnetic field enough to prevent Magneto from using his powers within, preventing him from returning to the planet's surface. In response, Magneto generates an electromagnetic pulse not only destroying the satellites, but deactivating every electric device on Earth within minutes. The X-Men respond by hacking into Avalon's own computer systems to teleport a small team to the station with the aid of Colossus (who joined Magneto's Acolytes moments after his younger sister Illyana's funeral). Magneto, during the battle with the X-Men, rips the adamantium from Wolverine's bones, which enrages Xavier to the point that he wipes his former friend's mind, leaving him in a coma. This action later leads to the creation of Onslaught, an omnipotent being formed from the combination of Xavier and Magneto's own dark sides, the darkness in Magneto's soul latching on to its counterpart in Xavier when he launched such a devastating assault. [volume & issue needed] Magneto remains comatose on Avalon, worshiped by his Acolytes under the leadership of the ancient mutant Exodus, until Avalon itself is destroyed by the arrival of Holocaust from the Age of Apocalypse Earth. During the destruction, Colossus places Magneto in an escape pod sending him back to Earth. [volume & issue needed] This pod is intercepted by Astra, a former ally who now desires his death. Despite the UN's hopes that Genosha's civil war between humans and mutants would destroy or at least occupy him, Magneto crushes all opposition to his rule and rebuilds the nation by forming an army of mutants dedicated to his cause, including mutants coming from all over the world seeking sanctuary. [volume & issue needed] Eventually, Magneto uses the Genegineer's equipment to fully restore his power. Intending to declare war on humanity, he captures Professor X to use as a symbol with which to rally his troops. [volume & issue needed] Jean Grey recruits a new group of X-Men to help Cyclops and Wolverine rescue Xavier; they defeat Magneto when Xavier psychically cuts off his access to his powers. Taking the opportunity for revenge, Wolverine attacks the depowered Magneto, crippling him with serious injuries. While Magneto recovers from his injuries, Genosha is attacked by an army of Sentinels sent by Xavier's long lost twin sister Cassandra Nova Xavier. Over 16 million mutants and humans die. The attack comes just after Polaris (one of the survivors) discovered the truth about her biological relationship as Magneto's daughter. [volume & issue needed] Magneto's supposedly last moments are spent revealing to Genosha Polaris' status as his daughter. Charles Xavier is met on Genosha by Magneto, who apparently survived Cassandra Nova's attack and lived unnoticed within the ruins. [volume & issue needed] Xavier and Magneto put aside their differences to rebuild the island nation, rekindling their friendship in the process. 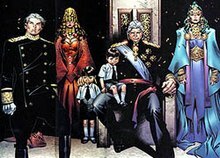 The House of Magnus, from left to right: Quicksilver, Scarlet Witch, her two children William and Thomas, Magneto, and Polaris. A group of heroes is brought together by Wolverine — who alone remembers the way the world is supposed to be because his 'heart's desire' was to regain all the memories stolen from him by the Weapon X Program — and have their own memories of the "real world" restored by Layla Miller. They band together and attack Magneto in Genosha, believing him to be the one responsible. During the battle Layla is able to restore Magneto's memories, and he confronts his son. Enraged that Quicksilver had done all of this in his name, Magneto kills him. Sensing her brother's death, Wanda resurrects him and retaliates with the phrase "No more mutants", changing the world back to its original form and causing ninety-eight percent of the mutant population to lose their powers, including Magneto. Magneto is left a broken man. In the 2006 miniseries Son of M, which follows up "House of M", when Quicksilver comes to Genosha to restore the mutants' powers with the Inhumans' Terrigen Mists, Magneto condemns his actions, pointing out the disastrous effects the Mists have on non-Inhumans. Quicksilver attacks Magneto with his new powers from the Mists, and savagely beats him until his own daughter Luna stops him. Marvel's editor in chief at that time, Joe Quesada, elaborated on the issue of Xorn and Magneto, stating that "Kuan-Yin Xorn came under the influence of as-yet-to-be-revealed entity that forced him to assume the identity of Magneto." However, the issue of Xorn and Magneto was ultimately resolved during "The Collective" arc in New Avengers. A powerless Magneto is attacked by Xorn, who has somehow evolved into a being of pure energy and merged with both an energy absorbing mutant named Michael Pointer and free floating mutant power energy that manifested after Scarlet Witch depowered the bulk of the mutant population. Xorn reveals that he, of his own free will, impersonated Magneto in order to rally mutantkind against humanity but failed due to the quality of his impersonation. He possesses Magneto and briefly reactivates his powers before being defeated by the New Avengers and a cadre of heroes, including Magneto's former son-in-law Vision and Inhuman S.H.I.E.L.D. agent Daisy Johnson. Iron Man, Ms. Marvel, and the Sentry combine their powers and send Xorn into the Sun. Michael Pointer and Magneto are freed as a result, though Magneto is arrested and loaded into a S.H.I.E.L.D. helicopter. The helicopter, however, explodes upon take-off through unknown means as Magneto uses what was left of the energy provided to him by Xorn to escape. In the 2008 storyline "X-Men: Divided We Stand", Magneto appears, apparently at the behest of Exodus and claiming to be powerless, to help restore the broken psyche of Professor Xavier. Together they revive Xavier before being attacked by Frenzy. Magneto wounds Frenzy by firing a medical laser into one of her eyes. Seeing the injury of a mutant as a crime, Exodus attacks Magneto. Xavier challenges Exodus on the astral plane. After Xavier defeats Exodus, he leaves Magneto and Omega Sentinel to try and rebuild his lost memories. Magneto, his powers artificially simulated by a suit designed by the High Evolutionary, reactivates Sentinels to attack the X-Men, who had recently relocated to San Francisco. Though he is defeated, Magneto's attack serves its purpose as a distraction so the High Evolutionary can gain an unknown object from the Dreaming Celestial. After extensively examining the Dreaming Celestial, the High Evolutionary subjects Magneto to a dangerous technological procedure, restoring his powers. In the "Nation X" storyline, impressed with the X-Men's efforts in defending and helping mutantkind, Magneto offers to work with them on Utopia, the new mutant homeland created by the X-Men using the remnants of Asteroid M. He aids the X-Men in defending Utopia Island from an attack of Predator X monsters. Now considered a member of the X-Men, Magneto assists them in stabilizing the asteroid from sinking into the Pacific. To that end, he works with Namor and the Atlanteans by constructing a pillar supporting Utopia on the surface that would provide a home for the Atlanteans, which Magneto would later refer to as New Atlantis. However, Cyclops reprimands Magneto for acting on his own authority. Despite Xavier being apologetic and appreciative for what he'd done, Magneto leaves Utopia for nearby Mount Tamalpais in Marin County. In a final bid to gain their trust, Magneto enters a deep meditative catatonic state to focus his powers at an interstellar distance and reverse the path of Breakworld's "Earth-destroyer" Metal Bullet in which Kitty Pryde is trapped. Magneto had encountered the bullet earlier while working to regain his powers with the High Evolutionary, and surmised that Kitty was inside. He had chosen to focus on ways to restore the powers of mutants, but memorized the metals of the bullet allowing him to keep a trace on it. Magneto brings the bullet back to Earth, drawing Kitty out of it and levitating her safely to the ground. However, the strain of using his power at such intensity and duration leaves him comatose. In the "Second Coming" storyline, Magneto comes out of his coma right after Hope is teleported into Utopia by a dying Nightcrawler. With the Nimrods laying siege to Utopia, Magneto stops Hank McCoy from leaving his patients as he prepares to enter battle himself. Magneto holds off a squad of Nimrods, dismembering the robots by pulling shards of iron from the core of Utopia through them. Magneto learns that the Young Avengers are going to search for the still missing Scarlet Witch, and that the heroes Wiccan and Speed are the reincarnations of Wanda's children. Magneto meets them, stating that he wants Wiccan and Speed to finally know him as their grandfather, and helps them find Wanda. The Avengers attempt to stop Magneto, before Wiccan teleports Magneto and the Young Avengers to Wundagore Mountain. There they encounter Quicksilver, who attempts to kill his father. They discover that this Scarlet Witch is actually a Doombot in disguise. With his reputation around the world as a well-known mutant revolutionary/terrorist, Magneto is talked into finding a solution to the problem by Cyclops before it goes public that he is established in Utopia. With an earthquake inbound for San Francisco, Magneto uses his powers to stabilize the city's buildings, structures and metal vehicles, and to smooth the earth movements themselves, thus preventing any major damage and saving many lives. As a result, some of the city favors him, while others are reminded of how potentially dangerous he can be and has been.. In the 2012 storyline "Avengers vs. X-Men", Magneto fights Iron Man when the X-Men will not give Hope Summers to the Avengers. During the fight, Magneto senses the destructive force of the coming Phoenix. Iron Man stops the fight in favor of helping in the search for Hope. As he is leaving, Magneto tells him to find his daughter Scarlet Witch. After the battles around the world, Magneto and Psylocke meet Storm and an unconscious Doctor Nemesis at one of their hideouts. Magneto, Storm and Psylocke prepare to go to the Moon to help Cyclops. Magneto later informs Cyclops of Namor's assault on Wakanda. Magneto asks Professor X for his help as the Phoenix Force-powered Emma Frost's rule becomes more tyrannical. Magneto later joins the Avengers, the X-Men, and Hulk in confronting the Phoenix Force-powered Cyclops. Scarlet Witch uses her abilities to keep Magneto from being harmed. Following the defeat of Cyclops, Magneto and the other former members are reported to have gone on the run. After finding out that his control of his powers have been lost due to contact with the Phoenix Force, Magneto nonetheless teams up with Cyclops, Emma Frost, and Magik to start a new school for mutants, as new mutants have started appearing again, in the old Weapon X facility. Magneto also pretended to serve as a disgruntled informer for SHIELD but it turned out to be an attempt by him to infiltrate the organization. In 2014, Magneto starred in his first ongoing series, which was written by Cullen Bunn. Feeling disenfranchised by the state of mutant affairs, Magneto decides to venture off on his own to fight for mutantkind's survival on his own terms. The series has been cancelled with issue #21 being its last issue which saw Magneto failing to stop the Ultimate Marvel Earth from colliding with the 616 Earth and thus resulting in the deaths of Magneto and his daughter Polaris. 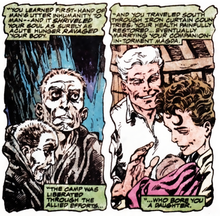 During the 2014 "AXIS" storyline, Magneto enters the island of Genosha to find that it has turned into a concentration camp for mutants. He frees two mutant girls who tell him that Red Skull is responsible and possesses Professor X's brain. Magneto attacks Red Skull, but is quickly stopped by his S-Men. Magneto is captured and mind-tortured by Red Skull. He is given visions of those closest to him suffering while being unable to do anything to stop it. After being freed by Scarlet Witch, Rogue, and Havok, he bites down on a vial beneath his skin of Mutant Growth Hormone, giving himself enough power to fight. When Havok, Rogue, and Scarlet Witch want to leave the island and alert the rest of the Avengers and X-Men of what Red Skull is doing, Magneto says he's going to stay and fight. Before they can do anything, Red Skull appears. Red Skull now has the group mind-controlled. He plans on using Scarlet Witch's power to shape reality in his image. He tells Magneto to bow if he wants his daughter to remain alive, but Magneto performs a sneak attack enough to break Red Skull's control over the others. In a fit of rage over finding mutants being used for freak medical experiments, Magneto kills the entire S-Men team. Magneto then attacks Red Skull, all while Red Skull tells Magneto that Professor X's greatest fear was him leading the X-Men. Magneto kills Red Skull while the others look on in horror. Magneto believes everything is over only for Red Skull to reappear as a giant called Red Onslaught. In order to combat Red Skull's Red Onslaught form, Magneto forms an unnamed group consisting of Absorbing Man, Carnage, Deadpool, Doctor Doom, Enchantress, Hobgoblin, Jack O'Lantern V, Mystique, and Sabretooth. After the villains were inverted by the spell cast by Scarlet Witch and Doctor Doom, the group was soon named the Astonishing Avengers. When Quicksilver and Magneto try to talk the inverted Wanda down, Wanda attacks them with a curse designed to punish her blood relatives, but when only Quicksilver reacts, Wanda realizes that Magneto is not their biological father. After Daniel Drumm's ghost possesses Scarlet Witch and works with Doctor Doom to reverse the inversion spell, Magneto was affected by it and stopped being a threat to mankind. When Magneto arrives on Genosha and is confronted by S.H.I.E.L.D. agents, Magneto surrenders to them. During the "Last Days" part of the "Secret Wars" storyline, Magneto had to make a choice during the incursion between Earth-616 and Earth-1610. To save the mutant race, he must attempt to destroy the world colliding with his own. To save the mutant race, he must also protect the humans, who are currently celebrating him as a hero and look on with fascination at what he attempts to do when Earth-1610 throws Sentinels against him. As the energies of Earth-616 and Earth-1610 inched closer to impact cascade and send chaos through the streets, Magneto (aided by his daughter Polaris) are taking the fight to this "other" Earth, battling the parallel Sentinels sent after them. Polaris is shocked to see the energy levels her father is exhibiting, all the while trying to protect the people caught in the crossfire of Magneto and the Sentinels. Magneto clearly has one goal in mind, as he rips a building to pieces to use against the killer robots, not caring much for the collateral damage, or the human lives at risk, as people in the building fall to the ground below. Polaris chides him for so reckless an action as she goes to the rescue while Magneto reminisces the reason he's currently exhibiting this level of power. Magneto and his current right hand Briar worked with a chemist under Magneto's employ to pump him up with a new cocktail of various drugs to amplify his powers, but Magneto needed further assistance. Months before the final Incursion happened, Briar established at least initial contact with several scientists which included Doctor Doom, Mister Fantastic, the High Evolutionary, Mister Sinister, Doctor Nemesis, and Dark Beast. However, Magneto instead picked out of the lineup the Sugar Man. From him, Magneto acquires the means to initiate his plan, and thanks him in true Magneto style where he leaves Sugar Man barely alive. In the present time, Magneto continues to use the very magnetic forces of the planet to aid him, yet that's more power than he could ever channel and very quickly began taking a deadly toll on him. As Polaris tries getting him to take a break because his plan is killing him too quickly, Magneto began thinking that he doesn't believe in resting even for a minute in his eternal war to protect everything he cares about. He recalls picking up the Sugar Man's power amplifiers and his powers go into hyper-drive and he starts having brain aneurysms. Flip to present day, Magneto sees the S.H.I.E.L.D. coming to his aid and grins. Magneto tells Polaris that their help won't be needed for much longer and she says she doesn't understand but quickly figures it out what her father meant as Magneto absorbs her power and says that it is his responsibility alone and that he couldn't let her die alongside him and that she still has something to offer the world. Magneto's powers then go nova as all the powers of the Earth's North and South Magnetic poles and all the bio-electric energies of the Earth are channeled through him and he reflects on his life role. As part of the All-New, All-Different Marvel branding, Magneto has been returned to life with no memories of his apparent demise. In the wake of the massive anti-mutant uprising, combined with the discovery that the Terrigen Mists that were spread in the atmosphere are harmful to mutants, Magneto has gathered together a team of mutants (consisting of Archangel, M, Psylocke, and Sabretooth) as his own X-Men in order to defend mutants at any cost. Following the 2016 "Inhumans vs. X-Men" storyline, Magneto is killed by Psylocke per their agreement that she do this if he was to ever regress back his previous megalomaniacal approach to protecting mutantkind. Upon being left for dead in the Savage Land, his body was found by Exodus and healed by Elixir. Following the conclusion of the war between Inhumans and X-Men, with Medusa unleashing the device to destroy the Terrigen Cloud permanently, he was temporarily beaten by a maddened Emma, who lied to the rest of the mutants about Cyclops' true death to trigger the war. He is later saved by Medusa and about to best Emma for her traitorous act, but Havok prevents him and Medusa from executing Emma for the sake of his late older brother. In the 2017 "Secret Empire" storyline, it is revealed that Magneto wants to help the time-displaced original X-Men back to their home timeline. During the Secret Empire storyline, Magneto was approached by Captain America whose memories were altered by Red Skull's clone using the powers of Kobik to cause Captain America to think that he was a Hydra sleeper agent, later became a. Captain America pitched an idea to Magneto that involved a piece of land in the western United States be granted to the mutants that would be their independent nation with the condition being that no inhabitant there would set foot on USA soil. When Hydra takes over the United States, Magneto gives in to Captain America's deal. As a result, New Tian is formed somewhere in California and Magneto fakes his death so that he can hide out in Madripoor. At the time when Emma Frost meets with Hydra Supreme Steve Rogers the same time the resistances are fighting back Hydra, Magneto flies outside the Hydra Helicarrier and uses giant shards of metal to attack it. During the "Hunt for Wolverine" storyline, Kitty Pryde leads Domino, Jubilee, Psylocke, Rogue, and Storm to Madripoor when they suspect that Magneto has excavated Wolverine's body. When they meet with Magneto at the King's Impresario Restaurant in Hightown, they discover that Magneto is actually Mindblast in disguise as it was part of an ambush by Viper and the Femme Fatales. Magneto is shown to be a prisoner of Viper and the Femme Fatales where Mindblast and Sapphire Styx put Magneto in a weakened state. When Kitty Pryde destroyed the psychic-enhancement equipment on Mindblast's back, Magneto recovers and starts to take revenge on Mindblast until Kitty suggests he leaves her and helps to stop the rocket that will be sent to Soteira. Due to Magneto still recovering from what Mindblast put him through, Kitty Pryde was able to evacuate Rogue and Storm from the rocket. Then Kitty and Domino persuaded Magneto not to take revenge on Mindblast. Magneto spares Mindblast's life and leaves her as a gift for helping him to escape. While Magneto denied any knowledge of taking Wolverine's body, he works to destroy the launch site and purge Madripoor of Viper's criminal empire while also pursuing Viper. Magneto is a mutant with the power to manipulate magnetic fields to achieve a wide range of effects. The primary application of his power is control over magnetism and the manipulation of both ferrous and nonferrous metal. While the maximum amount of mass he can manipulate at one time is unknown, he has moved large asteroids several times and effortlessly levitated a 30,000 ton nuclear submarine. [volume & issue needed] His powers extend into the atomic level (insofar as the electromagnetic force is responsible for chemical bonding), allowing him to manipulate chemical structures and rearrange matter, although this is often a strenuous task. He can manipulate a large number of individual objects simultaneously and has assembled complex machinery with his powers. He can also affect non-metallic and non-magnetic objects to a lesser extent and frequently wears metal bracelets on his ankles and wrists allowing him to levitate. He can also generate electromagnetic pulses of great strength and generate and manipulate electromagnetic energy down to photons. He can turn invisible by warping visible light around his body. Another way in which Magneto frequently uses his power is the projection of force-fields which selectively block out matter and energy. These fields are strong enough to withstand the simultaneous detonation of multiple thermonuclear weapons, hence Magneto is invulnerable to most harm when surrounded by his shield and can survive in deep space thanks to it. His shields have at times withstood the likes of the X-Men,[volume & issue needed] Thor,[volume & issue needed] Jean Grey as Phoenix,[volume & issue needed] and briefly during Secret Wars an attack from Galactus. [volume & issue needed] He can also channel his powers through his own body to increase his strength and durability far beyond human limits and has a baseline reaction time 15 times faster than those of regular humans. On occasion he has altered the behavior of gravitational fields around him, which has been suggested as evidence of the existence of a unified field which he can manipulate. He has demonstrated the capacity to produce a wormhole and to safely teleport himself and others via the wormhole. Magneto has been frequently depicted as able to resist all but the strongest or most unexpected of telepathic attacks. A number of explanations have been proposed for his unusually strong resistance to telepathy, among them: (a) technology wired into his helmet (the explanation given in several comic plotlines[volume & issue needed]), (b) some physical aspect of his electromagnetic powers that can interfere with telepathy (he once used the Earth's magnetic field to dampen the powers of all telepaths within his reach), (c) latent telepathic powers of his own or (d) sheer force of will (cf. X-Men Vol. 2 #2). The theme of latent telepathic powers has been explored in a number of stories, among them the Secret Wars limited series. In some of his earliest appearances, Magneto was depicted as capable of engaging in astral projection. He has used Cerebro to locate mutants at great distances while leading the New Mutants. [volume & issue needed] He has also, on rare occasions, been shown reading others' dreams, issuing telepathic commands, and probing the minds of others. He has demonstrated the ability to shield his mind, while in intense meditation, so completely that even Emma Frost was not able to read his thoughts, despite being directly in front of him and actively attempting to do so. In addition to his powers, Magneto has many other skills. He is a genius with competence in various fields of advanced science, especially in genetic manipulation, particle physics, engineering, and other fields of technology. He has engineered advanced weaponry, space stations, superpowered humanoid lifeforms, devices that generate volcanoes and earthquakes, that block telepathy, and that can nullify all mutant powers across a few miles except for his own. He has promptly reconstructed such computerized devices from memory. He has bio-engineered new species including the Savage Land Mutates,[volume & issue needed] and, using Deviant technology, Alpha the Ultimate Mutant. [volume & issue needed] He is fluent in many human languages and once single-handedly deciphered the unknown language of a lost civilization. He possesses extraordinary skill in "reading" the microexpressions on others' faces and sensing what they are thinking and feeling, whether they are lying, fearful, etc. a skill which he refers to as "taking your enemy's measure". He also is a master strategist and tactician with extensive combat experience, and has often been successful in single-handed combat against entire groups of superhuman adversaries. He also has some military training in hand-to-hand combat and has been shown to be effective with his fists, but he prefers to use his powers when in combat situations. Magneto was ranked number 1 by IGN's Top 100 Comic Book Villains list, was listed number 17 in Wizard's Top 100 Greatest Villains Ever list, and was ranked as the 9th Greatest Comic Book Character Ever in Wizard's list of the 200 Greatest Comic Book Characters of All Time, the second highest villain on that list. ^ Godoski, Andrew (2011-06-01). "Professor X And Magneto: Allegories For Martin Luther King, Jr. And Malcolm X". Screened. Archived from the original on 2011-06-18. Retrieved 2016-05-08. ^ Shutt, Craig (August 1997). "Bad is Good". Wizard (72). p. 38. ^ "''(Orthodo)X-Men, On Screen and Off'', Irving Greenberg, Jewish Daily Forward, 13 June 2003". Forward.com. 2003-06-13. Retrieved 2012-08-18. ^ Ami Eden (2003-05-23). "(Orthodo)X-Men". Jewish Daily Forward. ^ "Magneto". www.ign.com. IGN. Retrieved 5 June 2014. ^ Young, Paul. "Real Life Inspirations Behind Some of the Best Comic Book Villains". ^ Hanks, Henry. "The secret to 'X-Men's' success". ^ Darowski, Joseph J. The Ages of the X-Men:Essays on the Children of the Atom in Changing Times. p. 71. ^ Mordechai Shinefield (2008-06-07). "X-Men mutant survives the Holocaust in new Marvel Comics miniseries". Haaretz. Retrieved 2008-06-09. ^ The Religious Affiliation of Comic Book Character Erik Magnus Lehnsherr — Magneto. URL last checked 2010-09-28. ^ Meth, Clifford. Protocols of the Elders of Marvel Archived 2010-08-10 at the Wayback Machine. URL last checked 2010-09-28. ^ a b c Vision and the Scarlet Witch Vol. 1, #4 (February 1983). ^ Uncanny X-Men #200 (December 1985). ^ New Mutants #35 (January 1986). ^ New Mutants #37 (March 1986). ^ Secret Wars II #9 (March 1986). ^ Captain America #367 (February 1990). ^ Uncanny X-Men #275 (April 1991). ^ Quesada, Joe. "New Joe Fridays Week 03" URL last checked 2010-09-28. ^ New Avengers #20. Marvel Comics. ^ X-Men: Legacy #208. Marvel Comics. ^ X-Men: Legacy #209-#210, 2008. Marvel Comics. ^ Uncanny X-Men #500. Marvel Comics. ^ Uncanny X-Men #507. Marvel Comics. ^ "Uncanny X-Men (1963) #516 | Comic Books | Comics". Marvel.com. Retrieved 2012-08-18. ^ Uncanny X-Men #515-516. Marvel Comics. ^ Uncanny X-Men #520. Marvel Comics. ^ a b Uncanny X-Men #521. Marvel Comics. ^ Uncanny X-Men #522. Marvel Comics. ^ Uncanny X-Men #524. Marvel Comics. ^ New Mutants #11. Marvel Comics. ^ X-Men Legacy #237. Marvel Comics. ^ Uncanny X-Men #526. Marvel Comics. ^ Avengers: The Children's Crusade #1. Marvel Comics. ^ Avengers: The Children's Crusade #2. Marvel Comics. ^ AvX: Versus #1. Marvel Comics. ^ Uncanny X-Men Vol. 2 #13. Marvel Comics. ^ Avengers vs. X-Men #8. Marvel Comics. ^ Avengers vs. X-Men #10. Marvel Comics. ^ Avengers vs. X-Men #11. Marvel Comics. ^ Avengers vs. X-Men #12. Marvel Comics. ^ All-New X-Men #1-5. Marvel Comics. ^ Uncanny X-Men Vol. 1 #1-3. Marvel Comics. ^ Magneto Vol. 3 #9. Marvel Comics. ^ Magneto Vol. 3 #10. Marvel Comics. ^ Uncanny Avengers #24. Marvel Comics. ^ Uncanny Avengers #25. Marvel Comics. ^ Avengers & X-Men: AXIS #2. Marvel Comics. ^ Avengers & X-Men: AXIS #6. Marvel Comics. ^ Avengers & X-Men #9. Marvel Comics. ^ Magneto Vol. 3 #14. Marvel Comics. ^ Magneto Vol. 3 #18. Marvel Comics. ^ Magneto Vol. 3 #19. Marvel Comics. ^ Magneto Vol. 3 #20. Marvel Comics. ^ Uncanny X-Men Vol. 4 #1. Marvel Comics. ^ Civil War II: X-Men #1-3. Marvel Comics. ^ Civil War II #4-5. Marvel Comics. ^ Uncanny X-Men Vol. 4 #9. Marvel Comics. ^ IVX #6. Marvel Comics. ^ X-Men Blue #1. Marvel Comics. ^ Captain America: Steve Rogers #17. Marvel Comics. ^ Hunt for Wolverine: Mystery in Madripoor #1. Marvel Comics. ^ Hunt for Wolverine: Mystery in Madripoor #2. Marvel Comics. ^ Hunt for Wolverine: Mystery in Madripoor #3. Marvel Comics. ^ Hunt for Wolverine: Mystery in Madripoor #4. Marvel Comics. ^ "Magneto". Marvel. Retrieved May 31, 2015.